Please select your item below to add to your shopping cart and complete your purchase. 1. We have improved the bidding and play. 2. 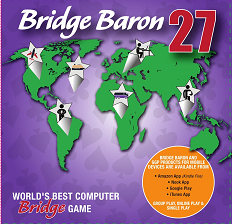 We have added six new Bridge Tournaments for free: the 2015 Cavendish (with cross-IMPs scoring), the 2016 NSWBA ANC Butler Open Selection (with Butler IMPs scoring), the Winter 2016 Blue Hen Sectional, the Winter 2015 Dave Treadwell Sectional, the Fall 2016 Diamond State Sectional, and the Spring 2016 Wilmington Sectional. 3. We have added 24 new challenging problem deals for a total of 482 Challenges. Kit Woolsey, multiple world champion and author of several bridge books, designed the new deals. 4. We have greatly improved the graphical user interface for MAC version and some improvements were made for the Windows version.